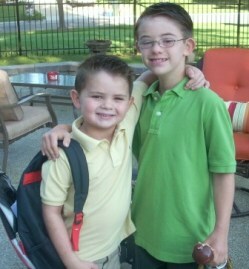 We had another crazy summer: summer school, camps, sports, and then prepping for the start of school. Since last year was not a great year for Jack (new teacher, new therapist, new curriculum, and on top of that he broke his arm and had surgery…he was shutting down) we decided that we were going to take a very proactive approach to make sure this year goes better. I know that this seems like a lot of work, but again, we are Jack’s parents as well as his voice and all the extra work we feel has paid off. Jack is doing remarkably well in every subject; he loves his teacher and his peers. We just had Jack’s first parent-teacher conference for the year, and two of Jack’s therapists told us that he seemed like a new kid. Everyone has the same expectations, and they began from the beginning of the school year. I think that has made a world of difference. So now we are into October, which is my busiest month since it is Down syndrome awareness month. 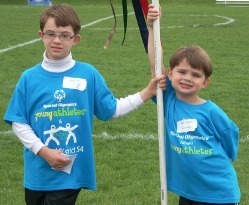 Every October, John and I try to do something different to raise positive awareness regarding Down syndrome and Jack. So in the past we have done bulletin boards, flyers to send home, and articles in the school paper, but this year a very good friend of mine helped me make a video emphasizing that being different is not all that bad. Well, the response has been tremendous and not only are they showing it to all of the children in Jack’s school of reading age, but the principal is trying to show it in every school in our district! When you say to yourself I am tired and I just can’t fight anymore; what difference am I going to truly make….all I can say is that you never know who is listening, whether it is the 1st person or 100th that will have an impact…you never know. I’d love to hear about any of the lessons that you learned. Please share!